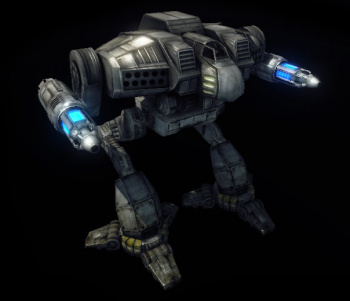 The Cougar is a Clan Light Mech focused on long-range damage and intelligence support. The Cougar is generally equipped with high-damage, long-range weapons, making it an effective early-game sniper against other Light and Medium Mechs. Cougars can carry a wide variety of equipment, making it an extremely adaptable chassis suitable for many roles. The Cougar Prime is equipped with two cLPLs a pair of cLRM10, giving it powerful long-range damage dealing capabilities that don't diminish until the enemy is practically hugging the unit. Equipped with B-Pod to help deal with Battle Armor, the Prime Variant is quite deadly, capable of dealing out respectable damage for a low price tag. 3 DHS don't stand a single chance of keeping the Cougar Prime running cool with all guns constantly firing, so care must be taken to not overheat. Chain-firing its weapons will keep the heat build up under control on most planets. On hotter planets you're better off just using either the LPLs or LRMs depending on your range, or just picking a different unit altogether. The A variant is a very capable short to mid range unit. The Cougar A is armed with a cLRM15, a cDSSRM6 and two cMPLs allowing it to handle threats at any range. It's best engagement range is one where it can bring all its weapons to bear, which is between about 50m, the minimum arming range of cLRMs, and 450m, the maximum range of the cSSRMs. Its improved Jump Jets enable it to move around the battlefield quickly, either to bring its shorter-ranged weapons to bear or to kite a slower enemy. Its LAMS provides useful team support and provides protection against enemy missile volleys. This mech can start to run hot in combat. The Cougar B is an ammo dependent scout variant. Armed with two CLRM5s and two CUAC5s, capable of a very effective mid- to long-range punch. Its TAG designator will place the CLRM5's right on target and allowing it to use its Enhanced Optics to mark targets for its team from 1300m out, beyond the effective range of most weapons and just outside its BAP enhanced radar radius. Its Improved Jump Jets Jets allow it both to reach vantage points for its role as a spotter / sniper, as well as giving it the capability to jump snipe. When not running passive near the edge of its effective range a C3 suite allows it to relay radar information to the rest of its team, but makes it even harder to hide from approaching enemies. The Cougar C is an aggressive NARC asset. Mounting a cNARC launcher fed by an extra ton of ammo, this variant is capable of jumping out of cover with its Jump Jets, sticking a beacon on a prey of its choice while leaving only a small window of retaliation, and exploiting it along with the rest of its team using its pair of cLRM10 launchers. Carrying its own NARC allows it to bypass the clan LRM limitation of not arcing over nearby obstacles by firing away from its designated target. Unfortunately, without any reloads the LRM racks will soon run out, but pilots are bound to stay until they run out of NARCs as its own indirect fire ability is a bonus and not enough to warrant taking the asset without dedicated friendly units to support. Providing some backup direct fire are a cERLBL and cERMBL, not dealing any insane damage, but capable of harassing targets at mid to long ranges as well as deterring BA with pinpoint strikes. Its two DHS usually don't have to work too hard to manage heat, as situations where it has to deploy all of its weapons and equipment usually mean it's in a bad spot and will soon either reposition or perish. The Cougar D comes as a very powerful brawler. Strictly a close range, twin cHMLs allow for high damage while two cDSSRM4 add punch cockpit shake. The smart mech pilot must take into account the high heat output. Pacing the damage output will give it a chance to pack such a wallop. especially with only 3 Double Heatsinks. Its no doubt that D Variant will become a favorite to Mech pilots wanting to hunt down Battle Armors using its B-Pod, and Vehicles, which should give some a means to pausing and thinking twice facing this variant. On the equipment side, GECM helps it reach its desired engagement, and an 2 extra tons of armor gives staying power, similar to medium mechs. 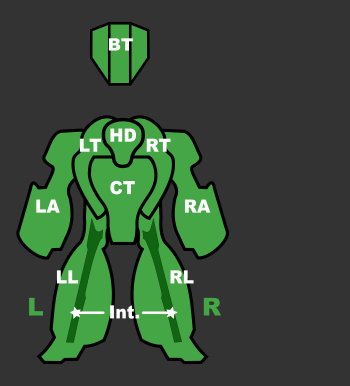 It have 800 more armor on side torsos, 1200 extra armor on center torso, as well as 1000 more armor on legs. Arms, back torso and internals gaining only 500 more armor. The Cougar E is a powerhouse at medium range. Twin ATM6s with 2 extra tons of ammo give it range and endurance. Its three cERMBLs back these up, doubling as point defence within their minimum range. Its Standard Jumpjets afford it a degree of jump-sniping ability, the ATMs often managing to lock and fire against active radar enemies before you drop back behind cover. With only a pair of DHS this is an attack pattern that is impossible to sustain, requiring breaking off to cool down and judicious use of chain fire during prolonged engagements even without using the jets, controlling laser use to leave enough heat capacity for missile volleys. Sporting 5 cSPLs and 2 cDSRM4s and an extra ton of armor, the F variant is a very short range focused brawler with an effective range of 350m. Thankfully, Improved Jump Jets give it an easier time approaching enemies and a BAP gives it greater awareness of the battlefield, despite users usually switching to passive as they begin their approach. Its five DHS add much needed cooling support, as care must be taken to not overheat if mixing combat jumping with alpha strikes. A variant intended for extreme range fire or anti-air duty. The Cougar G mounts two ATM6 ER launchers capable of locking onto targets 1250m away, as well as two cERLBL providing pinpoint damage at 900m out and, of course, Enhanced Optics to more accurately use them. Jump Jets enhance the unit's manoeuvrability, allowing it to reach a vantage point with clear line of sight to the enemy beyond their weapon's reach, as well as enabling swift escapes from approaching units. Being afforded no extra tons of ammo, the unit is dependent upon supply lines, and even then its damage dealing potential is somewhat low due to the underpowered nature of extended range ATM munitions. 2 DHS don't provide enough heat dissipation for constant alpha strikes due to the poisonous heat generated by clan large lasers, but operating at extreme ranges using just the ATMs is a cooler if somewhat underpowered proposition. After the Refusal War with Clan Wolf, Falcon Khan Marthe Pryde decided to upgrade the 'Mechs her Clan fielded as they rebuilt. Rather than waste precious resources designing a new OmniMech from the ground up, she instructed her scientists to improve upon existing designs. The design the scientists chose to modify was the Adder. Though the two 'Mechs are visually similar and share the same weight, the Falcon Cougar is slower and better armed, though it only has six and a half tons of Ferro-Fibrous armor. This process enabled the Falcon scientists to produce a new design in roughly half the time it would have taken them otherwise. This page was last edited on 29 January 2019, at 14:11.